Mr. Blizzard's Brigade is a four-player minigame from Mario Party 4. In a snowy forest, a snowball rolls down the hill and comes to stop at an icy pond with the four players on it. Along with two others, the snowball's head appears, creating a Mr. Blizzard. The players get shocked, and the game begins. In the minigame, the players must run around avoiding the snowballs that the Mr. Blizzards throw. If a snowball touches a player, they will be frozen and are out of the game. It isn't easy to run at times, as the pond is slippery. The Mr. Blizzards face the direction they throw in before releasing their snowballs, so players should take that time to get out of their line of fire. However, there's no telling the range of any given throw. Every so often, the giant Mr. Blizzard throws a huge snowball. Also, over time, more and more Mr. Blizzards form, meaning more snowballs are thrown. The last character standing is the winner. The remaining players do a victory pose on the ice. Rules – "Run on this frozen pond while avoiding the snowballs thrown by the Blizzards." Advice – "Move right before the Blizzards throw their snowballs. They'll stop moving just before they throw." The same tactic is used in Mario Party 9's Snow Go. 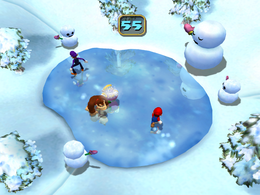 The minigame Snow Brawl from Mario Party 6 works in a somewhat similar way in which if a player gets hit with a snow ball, the player is out of the game. The difference between this minigame and Snow Brawl is that Snow Brawl is a 1-vs.-3 minigame while this one is a four-player minigame. This page was last edited on November 21, 2018, at 21:57.